Infrared (IR) radiation is a type of electromagnetic radiation (a wave with electricity) . The wave is longer than light which humans can see and shorter than microwaves. The word infrared means below red. It comes from the Latin word infra (meaning below) and the English word red. (Infrared light has a frequency below the frequency of red light.) Red light has the longest wavelength that human eyes can see. Infrared waves cannot be seen by the eye. Near-infrared waves are between 800 nm and 1.4 µm. Most infrared from the Sun is near-infrared. 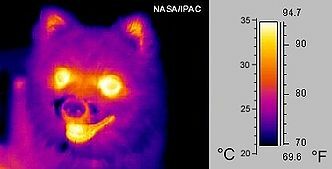 Thermal imaging is mostly done with thermal radiation waves between 8 and 15 µm. People sense infrared as heat. Most remote controls use infrared to send the control signals. Many missiles for anti-aircraft warfare find their target by infrared. Before Bluetooth was invented, some computers, personal digital assistants, and mobile phones were using the infrared technology to send files to other devices. Bluetooth replaced infrared in the early 2000s. Infrared is limited by the need to have both devices in a "line of sight" with each other. ↑ Bedell, Doug (2002-08-29). "Electronics unplugged - Bluetooth radio technology becoming reality in cellphones, printers, PDAs, headsets ..." (NewsBank). The Dallas Morning News. p. 3D. Retrieved 2010-12-13. This page was last changed on 10 March 2019, at 00:02.